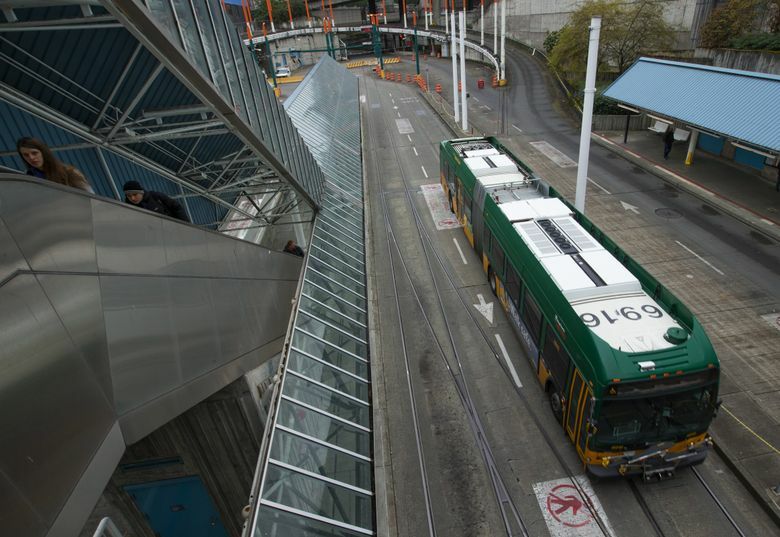 With the closure of Convention Place Station, bus riders will instead use Ninth Avenue, where Metro Transit has installed new rain shelters, a northbound red bus-only lane and curb markings. Convention Place Station permanently closed Saturday, July 21, making room for the state convention center next door to double in size. Bus riders will instead use Ninth Avenue, where King County Metro Transit this week finished installing new rain shelters, a northbound red bus-only lane and curb markings. 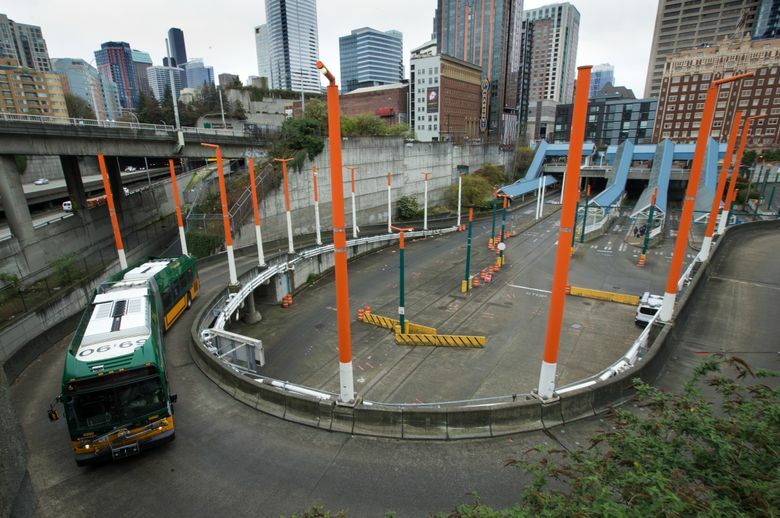 Buses at the Downtown Seattle Transit Tunnel will get up to Ninth using a temporary, $4 million ramp until March, when construction crews take over that too — and evict buses entirely from the tunnel. Buses also will be crowding the surface streets more as drivers park for rest breaks, instead of doing so at the station. The changes affect 5,400 daily bus customers who board or exit 817 buses per weekday on routes 41, 74, 101, 102, 150, 255 and 550. However, these buses will continue serving International District/Chinatown, Pioneer Square, University Street and Westlake stations until March. Convention Place Station, which is partly outdoors and partly under canopies, sits at the north end of Metro’s tunnel that opened for service in 1990. For the next nine months or so, it will continue to be the only downtown tunnel in the world shared by buses and trains. Sound Transit’s light-rail trains will continue through the tunnel as normal, making connections to Capitol Hill and the University of Washington. Trains have never used Convention Place Station, but proceed directly from Westlake Station into their own tunnel extension beneath I-5. By 2021 trains will reach new stations at the University District, Roosevelt and Northgate. Metropolitan King County Council members this past year approved the $275 million sale of the county-owned transit property to the convention center authority. The $1.6 billion convention-center project will add space for exhibits, meetings, parking, housing and offices.